How to keep your backyard safe & organized should top your “to do” list. The space in and around tool sheds can get messy, fast. From storing the lawnmower, piling in garden tools, and housing multiple yard-accessories like pots, bags of soil, and equipment, the space and tidiness of the shed is quickly compromised and often ignored. Martha Stewart suggests using a trellis to organize all of your garden tools. It’s a ready-made grid that can allow you to hang almost anything. Simply attach the trellis to the wall of the garden shed and hang your tools using “S” hooks. Larger yard tools, like shovels and rakes, for example, can be organized with PVC pipe. Tackle this garden tool organization project yourself! Begin by cutting the PVC pipe into six-inch pieces at a 30-degree angle. After you’ve cut the pipe, smooth over the edges with some light sanding. The 30-degree angle makes it easier to drill holes in each piece of pipe. Drill a hole at the top and bottom center of each piece and use a large sheet of plywood to screw the PVC holders in place. Adhere the plywood to your shed wall and then organize your large tools within the piping. You can also use duct tape and a permanent marker to label each tool’s proper place. 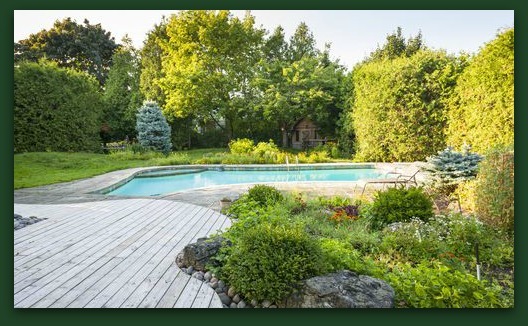 If there’s a pool in your backyard, it will likely be the star of the show this summer. Be sure to keep safety top-of-mind to avoid any accidents—pool toys, floats, and other accessories that are left scattered across the pool deck, can increase the chances of a pool-related injury or accident. Keep your pool deck safe by using racks and organizers for toys and equipment. In The Swim, a pool products retailer, offers an extensive variety of organization tools. Not only will organizing the outside area make the pool area safer, it will keep the pool deck looking neat and tidy all summer long! Backyard gardens are great for growing your own supply of fresh produce and herbs. Gardening is also a great way to pass the time in the warm summertime season. But gardens can also pose a risk to young children and your family’s pets if they are not properly cared for and maintained. Poisonous plants, fertilizers, weed killers, insecticides, and loose garden tools can harm pets and kids. Avoid using chemical-based products and store all of your garden tools in a safe, unreachable place, like a secure garden shed. Also, beware of certain types of mulches, like cocoa mulch and compost, which can pose a threat to pets. If you’re composting, use a bin that seals with a locking lid so nosy animals can’t get into your organic material. Storing your compost inside of a container will also help to keep your backyard more organized and can help contain odors.